Like this lesson? Share it with your followers by clicking on the image below. Use two or more programming languages, at least one of which is textual, to solve a variety of computational problems. Obviously, the more entertaining the original story, the better the laughs will be at the end! In this lesson, students will code a “Mad Lib” game in Python. The game will work by prompting the user to enter some words (e.g. person’s name, noun, adjective, place, object etc.) and substitute these with blanks in a story. Direct students to one of the online Mad Lib games listed below. Ask students to submit random words (as instructed) and note down some of the answers. Ask students to note down any unusual answers. Note: Use these sites at your own risk. teachwithict.com is not responsible for the content of external Internet sites. Mad Libs - http://www.madglibs.com/ (Click on each tile to reveal a mad lib). Display the mad libs starter PowerPoint (below) on the board and ask students to suggest words to fill in the blanks. You could get the class to vote for their favourite suggestions. 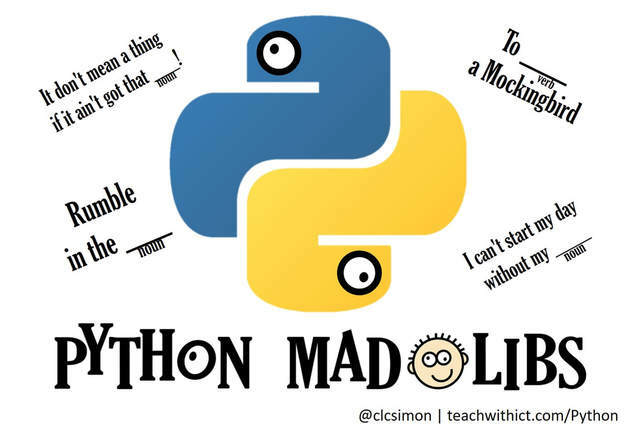 Once students have completed the starter activity, inform them that they are going to create a variation of the Mad Libs format using Python. comment their code, using the hashtag (#), explaining what the code is doing. create their own mad lib (If students struggle to come up with their own Mad Libs, they can use the examples from the starter activity). create a Mad Lib that contains 2 or even 3 user inputs. In the next example students are going to create a text file containing several mad libs. Just like the previous example, the program will ask the user to enter one or several nouns, verbs, adjectives etc. but this time will pick a Mad Lib at random from a text file. Before students create their text file, introduce them to the ‘string replace method’. Sometimes in Python, you find yourself in a situation where you want to modify the contents of string by replacing one piece of text with another. Luckily, Python makes this job easy thanks to the string replace method. ​string = "This is a string"
2. Ask students to comment their code to explain what it is doing. Explain to students that the line ‘string = string.replace(“is”, “was”) looks for the word “is” in the sentence and replaces it with the word “was”. Tell students that they will use the .replace() method to replace the blank(s) in their Mad Libs with the word(s) input by the user. It don't mean a thing if it ain't got that blank! I can't start my day without my blank! 2. Ask students to run their code – making note of and fixing any runtime errors. modify their code so that it displays the randomly chosen Mad Lib first before prompting the user for their response.